Arched and oval windows accent the elegant brick veneer of this three bedroom executive home. The open, formal dining room is defined by columns and capped by a graceful tray ceiling. A deep tray ceiling adds space to the generous great room which features rear clerestory dormers and built-in shelves on either side of the fireplace. The kitchen and breakfast bay share an impressive vaulted ceiling and access to the wrapping back porch. 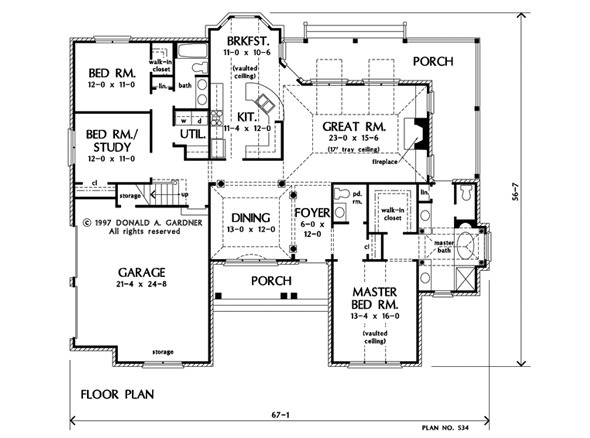 The vaulted master suite includes a roomy walk-in closet and a lavish bath with tray ceiling and back porch access. 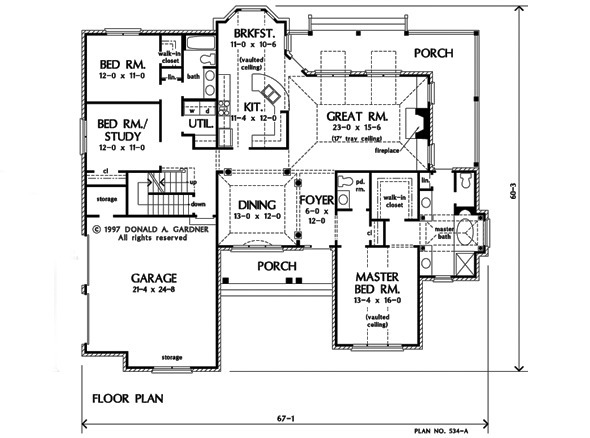 Two secondary bedrooms are on the opposite side of the house near a utility room and full bath with double sink vanity. The bonus room features attic storage and a cozy window seat. 1st Floor: 2198 Sq. Ft. 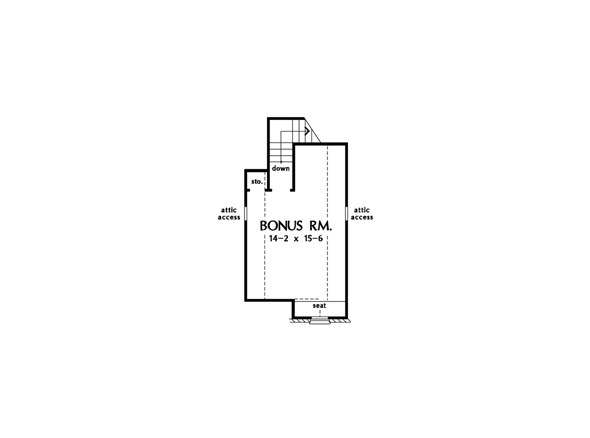 Bonus Room: 325 Sq. Ft.
House Dimensions: 67' 1" x 56' 7"
Great Room: 23' 0" x 15' 6"
Storage (Bonus) (Clipped): 2' 10" x 2' 6" x 8' 0"
Foyer : 6' 0" x 12' 0" x 9' 0"
Dining Room (Tray): 13' 0" x 12' 0" x 11' 1"
Great Room (Tray): 23' 0" x 15' 6" x 16' 10"
Kitchen (Vaulted): 11' 4" x 12' 0" x 13' 9"
Breakfast Room (Vaulted): 11' 0" x 10' 6" x 13' 9"
Utility Room : 5' 4" x 7' 8" x 9' 0"
Bonus Room (Vaulted): 14' 2" x 15' 6" x 8' 0"
Garage : 21' 4" x 24' 8" x 0' 0"
Garage Storage : 6' 8" x 3' 4" x 0' 0"
Master Bedroom (Vaulted): 13' 4" x 16' 0" x 15' 0"
Porch - Front : 18' 5" x 5' 6" x 0' 0"
Porch - Rear : 31' 4" x 6' 10" x 0' 0"
Porch - Right : 7' 8" x 15' 10" x 0' 0"
Storage (Other) : 14' 6" x 2' 6" x 0' 0"